There are many ways one can learn programming concepts, like from books, from ebooks, from interactive online tutorials, from videos etc. But you ever think to learn programming concepts from a robot. So now its time to change the mode of learning to future generation. 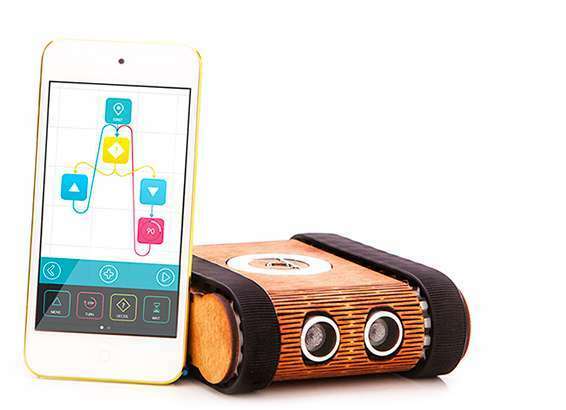 Meet Codie – a rolling and programmable robot which is controlled via a mobile application for iOS or Android. Codie was developed by Codie Labs, which was founded in February 2013 by serial entrepreneur András Holló and a friend he met in university, Ádám Lipécz with an idea of giving a simple introduction to programming concepts to children ages 6 through 15 through an easy-to-use app interface involving colorful drag-and-drop blocks that represent various actions you can take with the robot. The robot itself has a wooden exterior, two treads that allow to easily traverse flat surfaces (and some less-than-flat ones), and custom internals that include proximity sensors, a microphone and line readers that can “see” any graphical markings on the ground. An LED light on the top of the robot can also be customized to display different colors, using the mobile application. Coide, as the robot is called, gets around pretty quickly. He’s as fast as a little race car, and can be controlled either through the programs a child writes in the app or through a manual interface that includes an on-screen joystick that you can use to direct his movements. To write a program, kids drag blocks onto the app’s screen to dictate actions like “move,” “turn,” “decide,” “wait,” “sound,” and more. The blocks are connected with arrows, and, when tapped, kids can also customize the actions themselves in more detail to do things like adjust the speed, distance, color, brightness and much more. In addition, the programming language teaches larger coding concepts like “if, then, else…” decisions, or looping, for example.When you have completed a program, you can give it a name and save it for future use. Holló tells us Codie Labs raised funding for the project from an institutional investor in Hungary and an individual angel, totaling $250,000 USD. The startup also ran a crowdfunding campaign on Indiegogo this spring which reached $96,000 and allowed them to sell over 500 robots via pre-orders. So what do you think about this programming buddy Codie. Does it will a proper coding tutor for kids? We’d love to hear from you in the comments!